This design rests on the shoulder and has a detailed purple design as a canvas. 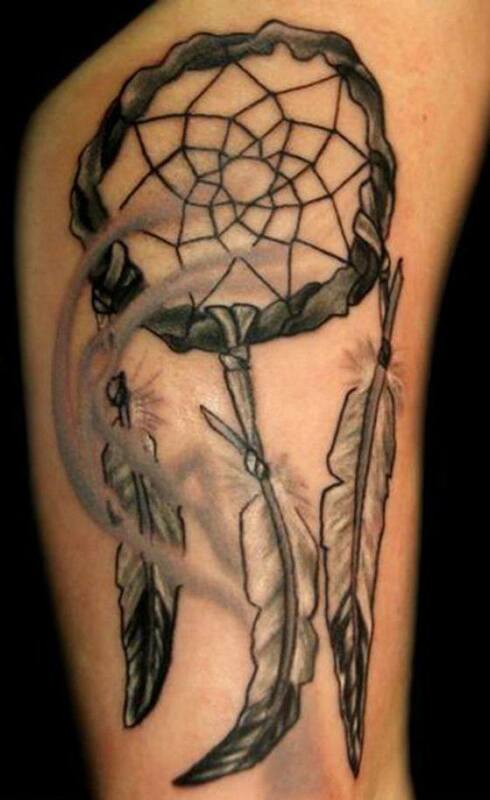 Atop is a woven dreamcatcher with a mixture of black and blue designs and what could be symbols. Four feathers hang from it to balance the piece. This design almost appears to be branded into the skin because of dark pink flesh-like hues that are used. The appearance of a tanned animal hide is in the center with a paw print. Five feathers hang beneath. The image is composed of only black, white, and grey. A basic circular design shadowed for contrast surrounds a mosaic. Three black and white feather hang below and are partially obscured by trails of grey running down the piece. 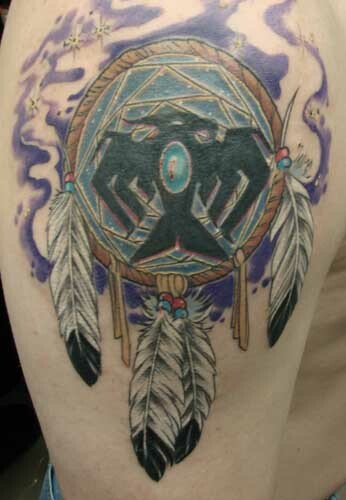 These images show multiple angles of dream catcher designs on arms. Each is particularly unique in the attention to detailing the feathers. Some are of a more basic black shadowing, while others incorporate color for added contrast. 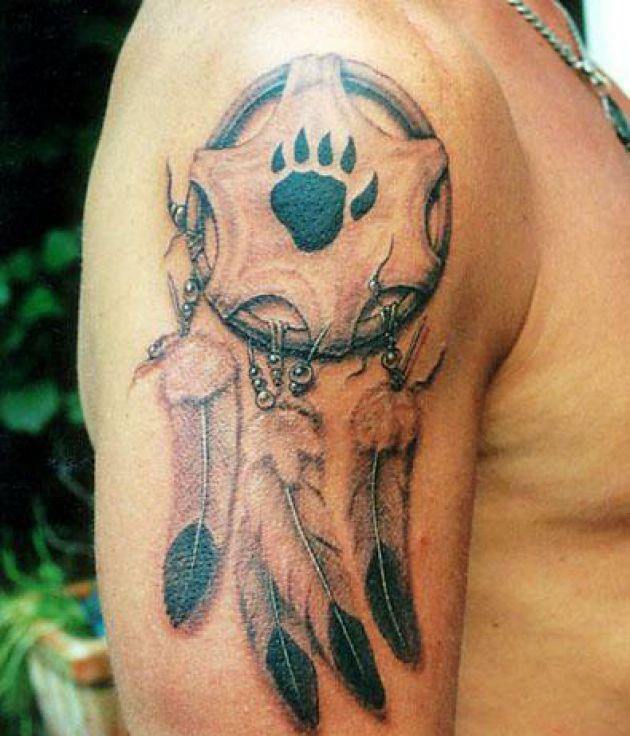 This design begins at the collar bone and trails down the arm. The center ring sits directly on the shoulder with writing inside. One feather falls across collar bone, and the remaining extend down the arm with pink and black contouring. 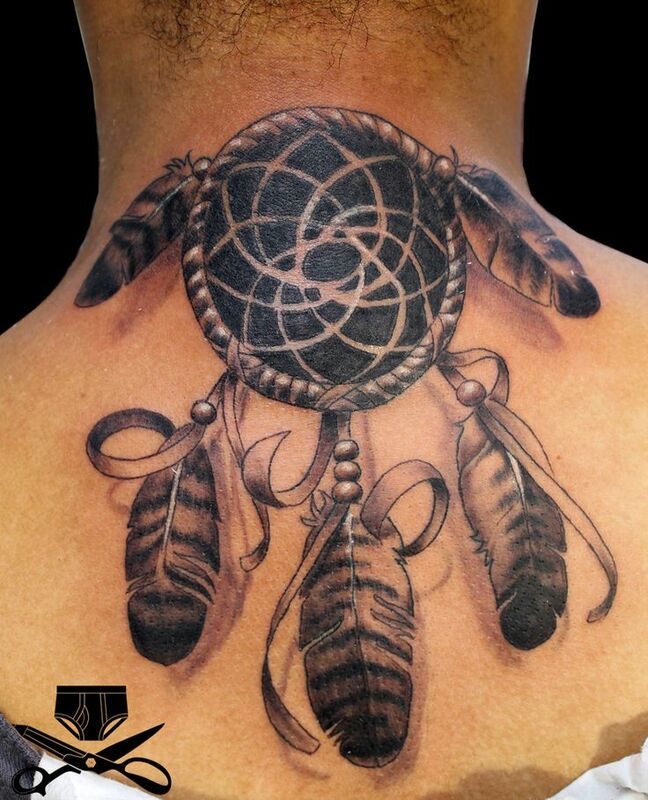 A simple yet intricate neck tattoo design, this dreamcatcher is sure to turn heads all around. It is done entirely in black ink, while the detailed shading truly makes the nuances pop. It is a brilliant way of warding away the bad while letting the good things enter your life. 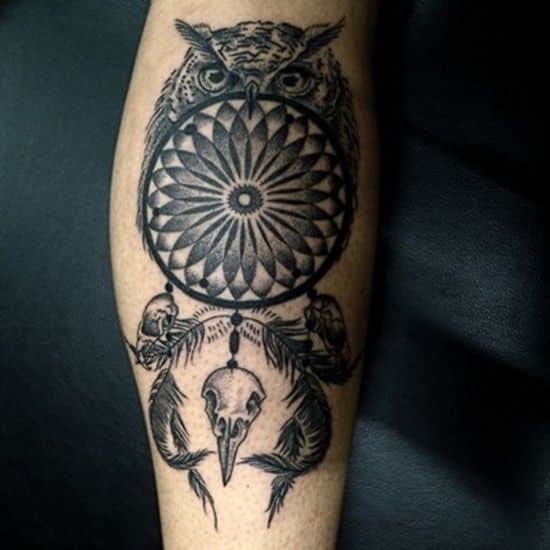 This black ink tattoo shows the dreamcatcher placed in the middle of the wise owl, depicting the entry of good things in your life. But just to add a tinge of morbidity, the feathers have been replaced by bones instead! 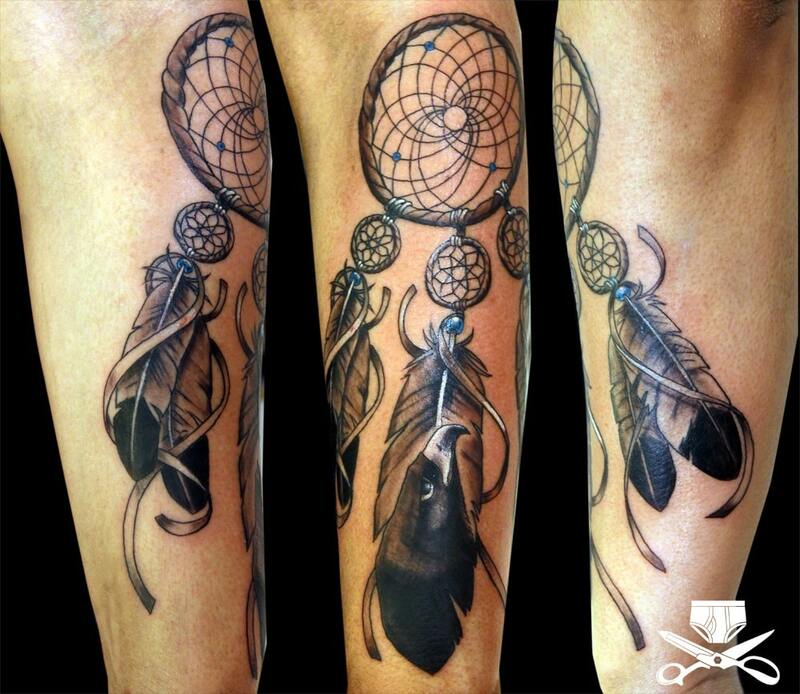 An ingenious take on the ever-so-popular dreamcatcher tattoo, here you see two beautiful symbols merged into one. The sacred Native American symbol is intertwined with the Chinese Yin & Yang. While the former works on warding away negative energy, the latter ensures a constant balance in life. 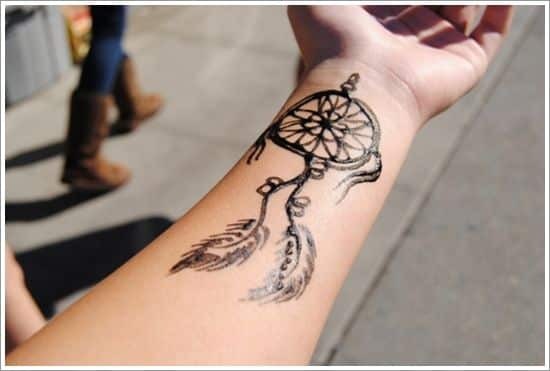 This small wrist tattoo is done in black ink, and looks stunning. The detailed lines emphasize its beauty while the bold black allows it to stand out against the skin tone. This is also a great way of showing off your personal beliefs to those around you. If you thought dreamcatchers were too girly – think again! 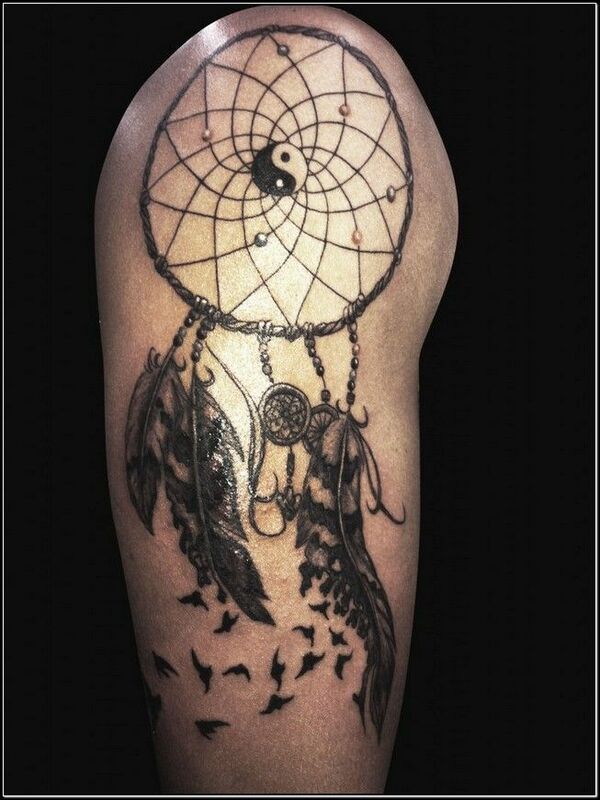 It can be one of the most perfect tattoo ideas for men when done right – like here. 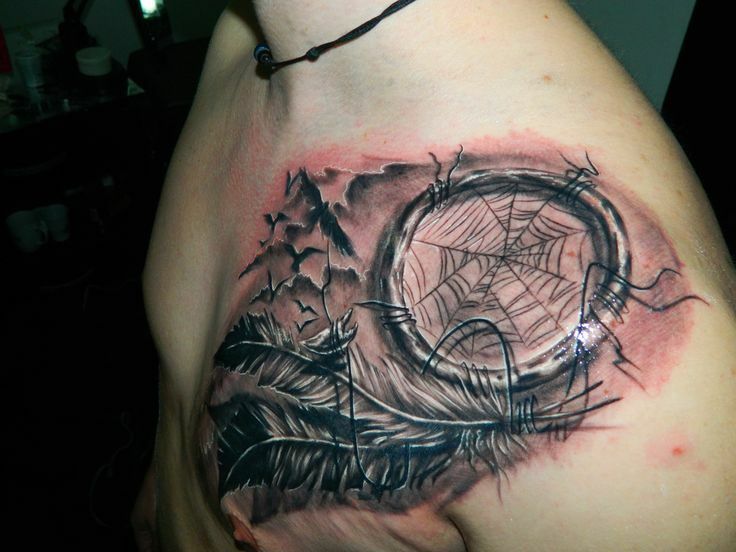 The dreamcatcher web is exchanged for a spider’s web, for one thing. Moreover, the red tinted background is enough to make the image morbid.